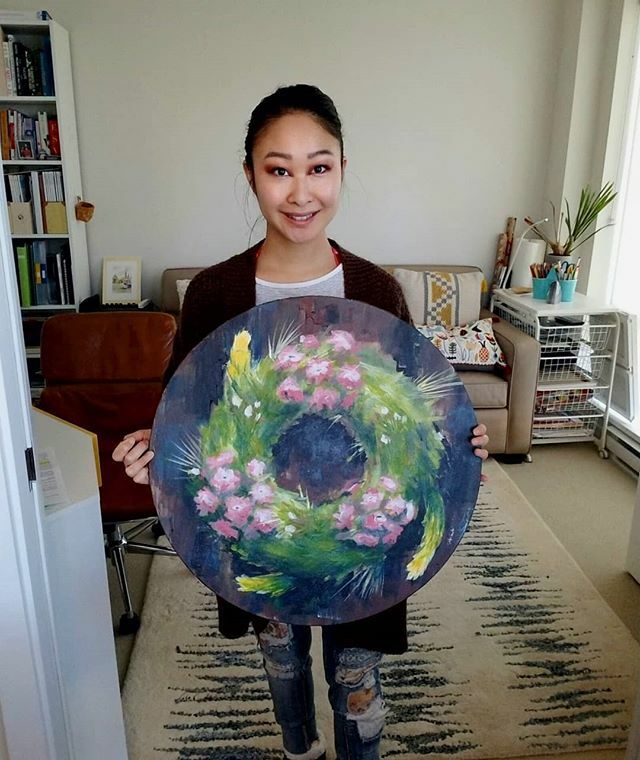 Acrylic on canvas️ 50.8 cm (20 in) diameter️ Up for auction November 23rd at the Promise GALA. All proceeds will benefit @upromiseyvr, a new youth centre supporting the Downtown Eastside.️ $150 starting bid. BC’s natural beauty played a special role in my childhood as I grew up climbing trees, building forts, picking berries, and braiding daisy chains. Our greenery is so abundant that it can be easy to overlook the fact that natural resources are finite. In reality, several plant and flower species in BC are endangered or at risk of becoming extinct. This wreath features 5 plant species that are becoming increasingly rare in BC: Haller’s Apple Moss Golden Paintbrush Pink Sand Verbena Bearded Owl Clover Bent Spike Rush.️I hope to evoke an appreciation for BC’s wild beauty, and also to remind us of its precious fragility. Let’s enjoy our beautiful surrounds by first being kind and mindful of them. Even simple acts are helpful: walk or cycle when possible to cut pollution, be mindful of litter and waste disposal, and become aware of/participate in local conservation efforts. The night will include live entertainment by DJ Barron S, DJ Omar Khan, a silent auction, photobooth and photostation by Butter Studios, Sarah Draws A Crowd caricature, drinks and nibbles. Reporter/anchor Lien Yeung from CBC News will be the evening’s MC.